Interested in becoming Catholic? Need to receive your Confirmation? 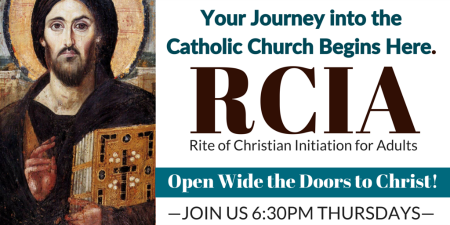 The Rite of Christian Initiation for Adults program (R.C.I.A.) begins Thursday, September 6th. Classes are held every Thursday night from 6:30 - 8:30 p.m. in Aquinas Hall. All parishioners interested in learning more about their Catholic faith are also welcome to attend (fully initiated Catholics do not need to register). Sponsors are also needed! Please email rciastaclt@gmail.com if you are interested in being a godparent/ sponsor for our RCIA program. Interested in RCIA at St. Thomas? Please email Fr. Bean or Gretchen for more information: rciastaclt@gmail.com. When Do RCIA Classes Begin? Our new year of RCIA begins on Thursday, September 6, 2017 at 6:30 p.m. in Aquinas Hall, directly across the courtyard from the Church. Classes continue each Thursday evening from 6:30-8:30 p.m. until the 2018 Easter Vigil. Regular attendance is required for those being prepared to receive the Sacraments of Baptism, First Communion, and/or Confirmation. Classes are also open for any and all parishioners who would like to come and learn about their Catholic faith. How Do I Register for RCIA or Adult Confirmation? Please register online here (or download and print form - available in the near future for those without computer access). Please note that documentation may be required (baptismal certificate, marriage documentation, etc), and must be submitted along with your application.